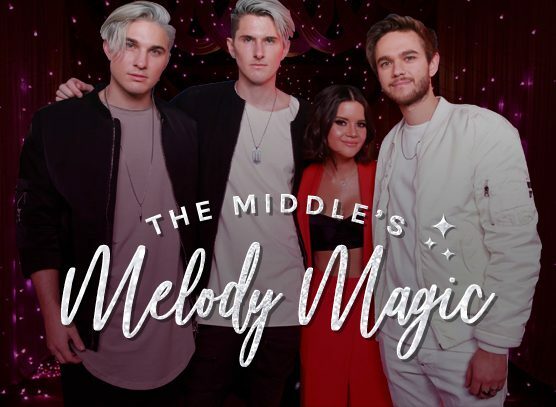 The Middle, Zedd’s most recent megahit, has been a long time coming. A collaboration with electronic duo Grey (who Zedd also worked with on 2016’s Starving), the song had been in production for quite some time but they had yet to find the right singer. After recording over a dozen vocalists, including A-listers Demi Lovato, Camila Cabello and Bebe Rexha, it was Country artist Maren Morris who best captured the song’s essence with her stellar vocal chops and evocative Pop and R&B inflected deliveries. In this article we explore how Morris’s vocals work hand-in-hand with songwriter Sarah Aaron’s expertly-crafted melody (no filler here, folks) to bring the lyrics to life and firmly ingrain the song in the listener’s head. For a more detailed analysis of the craft behind Morris’s vocals, the melody, and the songwriting and production techniques that contributed to The Middle’s success, stay tuned for our next Hit Song Deconstructed Report being published next week, The Middle Deconstructed. In the first verse the protagonist is reflecting on the fight she just had with the antagonist. Morris’s subdued delivery in a low register and greater concentration of descending melodic progressions (compared to the other sections in the song) effectively elicit a downtrodden vibe that heightens the impact of the lyrics. The section features a strong blend of repetition and contrast, with the common thread between all lines being the descending progressions at the end, which heightens familiarity and memorability. However, it’s important to note that none of these descending progressions are identical in construction, which prevents the melody from becoming overly redundant. The infectious, syncopated, staccato melody featured at the beginning of lines 3 and 4 helps to showcase Morris’s R&B influenced vocal chops to a mainstream Pop audience, many of whom are hearing her for the first time (Maren Morris is first and foremost a Country artist). The narrative shifts from downtrodden reflection to desire for reconciliation in the pre-chorus, which is expressed through the protagonist’s yearning to be embraced by the antagonist. The shorter length lines, faster rhythms and melodic direction shift evoke a more eager quality which jibes with, and accentuates, this narrative development. Additionally, the vocal shift to a higher register along with the changeup in accompaniment, which now features marching-style drums and a synth riser effect, creates a heightened degree of tension. This both enhances the impact of the narrative — since the protagonist’s “request” to be embraced by the antagonist has not yet happened — and increases anticipation for the summation/payoff that transpires in the chorus that follows. Now that the protagonist has expressed her desire to remain together with the antagonist, in the chorus she proposes that they compromise (i.e. “meet in the middle”) to put the fight behind them. Morris effectively communicates this message with a good deal of vigor by singing in a high register and delivering it with a driving eighth-note rhythm. The ascending melody of “oh ba-by” at the beginning of the chorus, coupled with the three beats of rest that follow, functions as an engaging “calling card” for the section by breaking up the flow coming out of the pre-chorus. The chorus also introduces a vocoder for the first time in the song, which harmonizes with Morris’s lead. The contrast it imparts compared to the preceding sections effectively enables the chorus to further stand out and connect with the listener. Additionally, note that none of the lines conclude on the tonic, which maintains a feeling of forward motion throughout the section. The second verse, second pre-chorus and second chorus all feature similar qualities as their first-occurrence counterparts. However, they’re not carbon-copies of one another, which helps to keep the song fresh and engaging as it progresses. The bridge provides a twist in the narrative where the protagonist seemingly goes against her suggested “meet me in the middle” compromise. Instead, she “pours out admission, regardless of her objection” in hopes of putting the altercation behind them. Morris’s vocals throughout the section exhibit both subdued and excited qualities, which reflect both her “giving in” as well as her desire for the antagonist. Lines 1 and 3 feature what are arguably the most vibrant and infectious melodies in the entire song due to their rhythms and ascent spanning a tenth. These lines also feature the most Country-inflected vocals from Morris, which connects with her Country roots. The impact of these highly vibrant lines is accentuated by the lower-register melody that defines line 2 and the more monotone qualities of line 4. Additionally, line 2 effectively jibes with, and accentuates, the downtrodden tone of the lyrics when compared to other lines in the section, while line 4’s sustained vocal intensity, coupled with the leap up to the fifth scale degree on the lyric, “pull,” greatly accentuates the impact of the lyrics where the protagonist is yearning for the antagonist to embrace her. The third chorus, which is the last section in the song, is unique in that it’s the only section that is composed of three stanzas as opposed to one or two. The first stanza, which possesses a very sparse accompaniment, features Morris’s highly evocative and tender vocal delivery as well as a more melismatic delivery compared to the other sections in the song. Along with the shift in accompaniment, this vocal changeup provides engaging contrast against the other choruses while concurrently shining a spotlight on Morris’s diverse vocal ability (i.e. she’s effective while belting it out and while being subtle and tender). The two stanzas that follow return to the more forceful delivery of the other choruses but with melismas mixed in. This both provides contrast against the other choruses and a heightened degree of passion, energy and excitement as the song heads toward a conclusion. Morris’s stellar delivery of the melody – which is equally strong and engaging in each section of the song – enabled the universal lyrical theme of compromise to easily connect and resonate with a wide audience and help send The Middle to the top of the charts throughout the world. For a more detailed analysis of the craft behind Morris’s vocals and the expertly-crafted melody, stay tuned for our next Hit Song Deconstructed Report being published next week, The Middle Deconstructed.